Surely you’ve seen this sign. It is popular in Austin, no wonder at that. Austinites confess their faith on bumpers, shirts, body parts and now a yard sign. 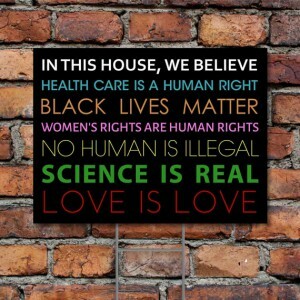 In a nutshell, this yard sign sums up succinctly what you are to believe, teach, and confess if you wish to be considered religious civilly and I mean this both in the sense of civilized and civil religion. However, please consider the inadequacies, the heresies, and shallowness of this creed as so cast. “Health care is a human right” …except when it infringes on the rights of others. “Black lives matter” …except in the womb where the per capita rate for abortion is 3 times for blacks what is for whites.”Women’s right are human rights”…except when they require the inhumane as they do with abortion. “No human is illegal”…except when he is doing something illegal. “Science is real”…except when it is junk science. “Love is Love”…except when it accepts, tolerates, promotes things contrary to the only Being who is love, God. This isn’t left versus right politics. This is competing theologies. No Christian would claim any life, even that of the unborn doesn’t matter. No Christian believes science is not to be used. Indeed, it is Christianity that puts man above creation and therefore gives him the right to study it. No Christian thinks any human in and of himself is illegal. We do believe there are such things as illegal acts and whosoever does them acts illegally. Christians are the ones who started hospitals, but we have never believed we had the right to make anyone else pay for them. Christians have always believed that women are human beings. We even confess that no one apart from being male or female is fully human. When women’s rights are championed at the expense of their being fully human, we’re opposed to that. Love is love is a meaningless tautology that the songs of the 60’s taught us and liberal theology believes. What is interesting about this sign is that it brings together the four pillars of civil religion, the religion of the public square, that church men, liberal theologians, and emerging churches clamor for a role in: Evolution, Abortion, the tyranny of the individual, and postmodernism.